Unauthorized immigrants living in the United States are more geographically dispersed than in the past and are more likely than either U.S. born residents or legal immigrants to live in a household with a spouse and children. In addition, a growing share of the children of unauthorized immigrant parents—73%—were born in this country and are U.S. citizens. These are among the key findings of a new analysis by the Pew Hispanic Center, a project of the Pew Research Center, which builds on previous work estimating the size and growth of the U.S. unauthorized immigrant population. 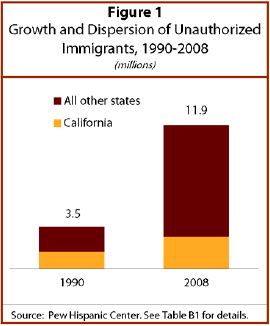 A 2008 report by the Center estimated that 11.9 million unauthorized immigrants lived in the United States; it concluded that the undocumented immigrant population grew rapidly from 1990 to 2006 but has since stabilized.1 In this new analysis, the Center estimates that the rapid growth of unauthorized immigrant workers also has halted; it finds that there were 8.3 million undocumented immigrants in the U.S. labor force in March 2008. Based on March 2008 data collected by the Census Bureau, the Center estimates that unauthorized immigrants are 4% of the nation’s population and 5.4% of its workforce. Their children, both those who are unauthorized immigrants themselves and those who are U.S. citizens, make up 6.8% of the students enrolled in the nation’s elementary and secondary schools. 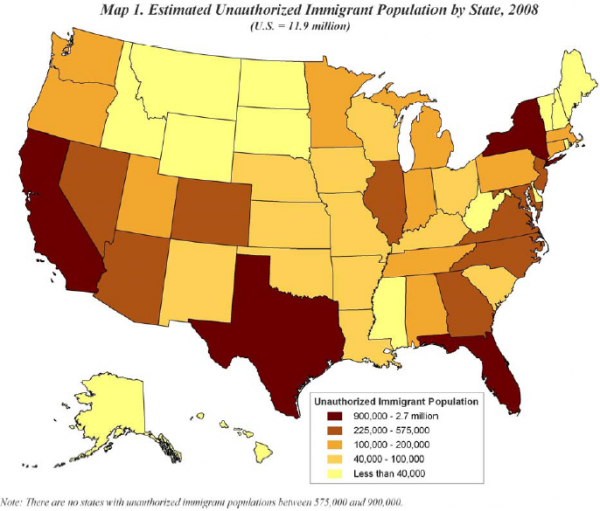 About three-quarters (76%) of the nation’s unauthorized immigrant population are Hispanics. The majority of undocumented immigrants (59%) are from Mexico, numbering 7 million. Significant regional sources of unauthorized immigrants include Asia (11%), Central America (11%), South America (7%), the Caribbean (4%) and the Middle East (less than 2%). Unauthorized immigrants are spread more broadly than in the past into states where relatively few had settled two decades ago. This is especially true in Georgia, North Carolina and other southeastern states. Long-time immigrant destinations, including Florida, Illinois, New Jersey, New York and Texas, also have retained their appeal to undocumented migrants. However, growth of this population has slowed in California. Although the Golden State still houses the largest number of undocumented migrants—2.7 million, or almost double the number in 1990—it is home to a markedly smaller proportion of them. Its 42% share in 1990 declined to 22% in 2008. Most unauthorized immigrant adults reside with immediate family members—spouses or children. About half of undocumented adults live with their own children under 18. 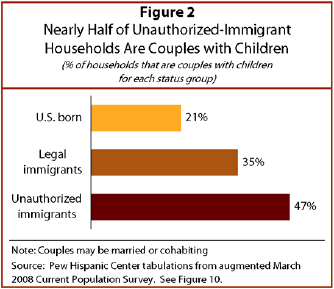 Nearly half of unauthorized immigrant households (47%) consist of a couple with children. That is a greater share than for households of U.S.-born residents (21%) or legal immigrants (35%). This difference stems in large part from the relatively youthful composition of the unauthorized immigrant population. 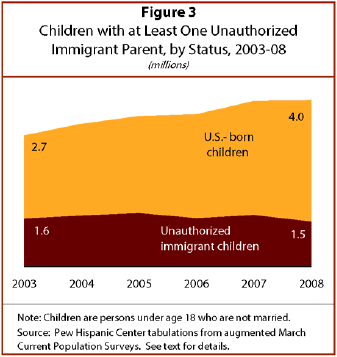 Most children of unauthorized immigrants—73% in 2008—are U.S. citizens by birth. The number of U.S.-born children in mixed-status families (unauthorized immigrant parents and citizen children) has expanded rapidly in recent years, to 4 million in 2008 from 2.7 million in 2003. By contrast, the number of children who are unauthorized immigrants themselves (1.5 million in 2008) hardly changed in the five-year period and may have declined slightly since 2005. Children of unauthorized immigrants are a growing share of students in kindergarten through grade 12. The Center, analyzing this group for the first time, estimates that 6.8% of K-12 students have at least one parent who was undocumented in 2008. In five states, about 10% or more of students are children of undocumented-immigrant parents. Most of these children, having been born in the United States, are U.S. citizens. 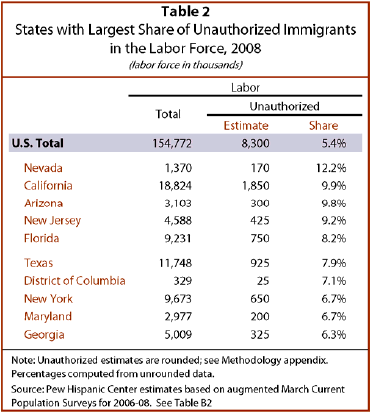 The nation’s labor force of 154 million people includes an estimated 8.3 million unauthorized immigrants. The 5.4% unauthorized-immigrant share of the labor force in 2008 rose rapidly from 4.3% in 2003, and has leveled off since 2007. The estimate for 2008 is not significantly different from 2007, so any assessment of recent trend is inconclusive because of the margin of error in these estimates. Among states, the proportion of unauthorized workers varies widely: They constitute roughly 10% or more of the labor force in Arizona, California and Nevada, but less than 2.5% in most Midwest and Plains states. They are especially likely to hold low-skilled jobs and their share of some of those occupations has grown. 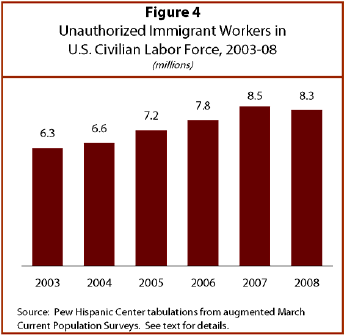 In 2008, 17% of construction workers were undocumented, an increase from 10% in 2003. One in four farmworkers is an unauthorized immigrant. Adult unauthorized immigrants are disproportionately likely to be poorly educated. Among unauthorized immigrants ages 25-64, 47% have less than a high school education. By contrast, only 8% of U.S. born residents ages 25-64 have not graduated from high school. An analysis of college attendance finds that among unauthorized immigrants ages 18 to 24 who have graduated from high school, half (49%) are in college or have attended college. The comparable figure for U.S.-born residents is 71%. The 2007 median household income of unauthorized immigrants was $36,000, well below the $50,000 median household income for U.S.-born residents. In contrast to other immigrants, undocumented immigrants do not attain markedly higher incomes the longer they live in the United States. A third of the children of unauthorized immigrants and a fifth of adult unauthorized immigrants lives in poverty. This is nearly double the poverty rate for children of U.S.-born parents (18%) or for U.S.-born adults (10%). More than half of adult unauthorized immigrants (59%) had no health insurance during all of 2007. Among their children, nearly half of those who are unauthorized immigrants (45%) were uninsured and 25% of those who were born in the U.S. were uninsured. This report outlines the demographic characteristics of unauthorized immigrants living in the United States in March 2008 and offers comparisons with legal immigrants and U.S.-born residents. 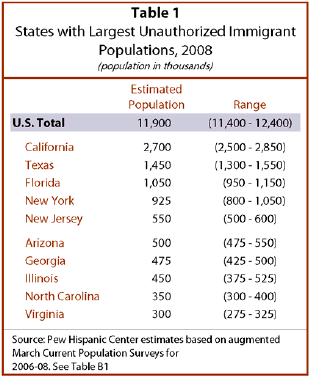 It also estimates the size of the unauthorized immigrant population and labor force for each state. These unauthorized immigrants consist of residents of the United States who are not U.S. citizens, who do not hold current permanent resident visas or who have not been granted permission under a set of specific authorized temporary statuses for longer-term residence and work. The vast majority of undocumented immigrants either entered the country without valid documents or arrived with valid visas but stayed past their visa expiration date or otherwise violated the terms of their admission. Also included in this group are some people who had entered without valid documents or violated the terms of their visas but later obtained temporary authorization to live and work in the United States. Among them are immigrants from certain countries holding temporary protected status (TPS) or people who have filed for asylum status but whose claims are unresolved. This group may account for as much as 10% of the unauthorized immigrant estimate. Many of these “quasi-legal” individuals could revert to unauthorized status. “Foreign born” refers to an individual who is not a U.S. citizen at birth or, in other words, who is born outside the U.S., Puerto Rico or other U.S. territories and whose parents are not U.S. citizens. The terms “foreign born” and “immigrant” are used interchangeably. “U.S. born” refers to an individual who is a U.S. citizen at birth, including people born in the United States, Puerto Rico or other U.S. territories, as well as those born elsewhere to parents who are U.S. citizens. The terms “unauthorized immigrants” and “undocumented immigrants” are used interchangeably. “Children” are people under age 18 who are not married. “Adults” are ages 18 and older. “Children of unauthorized immigrants” or “children of unauthorized immigrant parents” are foreign-born children and U.S.-born children who live with at least one unauthorized immigrant parent. In a “U.S.-born household,” both the householder and spouse or partner (if any) are born in the United States. In a “legal immigrant household,” either the householder, spouse or partner (if any) or both are legal immigrants. In an “unauthorized immigrant household,” either the householder, spouse or partner (if any) or both are unauthorized immigrants. “Spouse” includes unmarried partner unless otherwise noted; “couples” includes those both married and unmarried. II. Where Do They Live?